The head is of medium size in proportion to the body. The almond shaped eyes are deep set, rather large, and dark brown with black or slate gray eye rims. The ears, set on somewhat higher than the level of the eyes, are hanging, of medium size, V-shape, and about half the head length. The skull slightly domed and medium broad. The stop is defined, but not abrupt. The muzzle is strong and straight, a third of the head length, and ends in a nose of good size. The nose is always black. Flews and gums are black or slate gray. Flews are tight. A full complement of teeth, comparatively large, meet in a scissors bite. Neck, Topline, Body: The neck is strong, muscular, of medium length and free of throatiness. The back is level and strong, of medium length, with croup sloping slightly. The chest is moderately broad and deep - the ribs well sprung. The loin is short, strong and moderately tucked up. The tail is carried over, and blends into the backline. The shoulders are well laid back. Upper arm and scapula are approximately equal in length and form an angle of 90 degrees. The forelegs are straight, strong and medium boned with strong and flexible pasterns. Dewclaws, if any, may be removed. The round, compact feet have well arched toes and thick cushioned pads. The Puli stands well up on his pads. The pads and nails are black or slate gray. The Puli is typically a lively, acrobatic dog; light, quick, agile and able to change directions instantly. At a collected or contained trot the gait is distinctive: quick-stepping and animated, not far reaching, yet in no way mincing or stilted. When at a full trot, the Puli covers ground smoothly and efficiently with good reach and drive, the feet naturally tending to converge toward a median line of travel as speed increases. 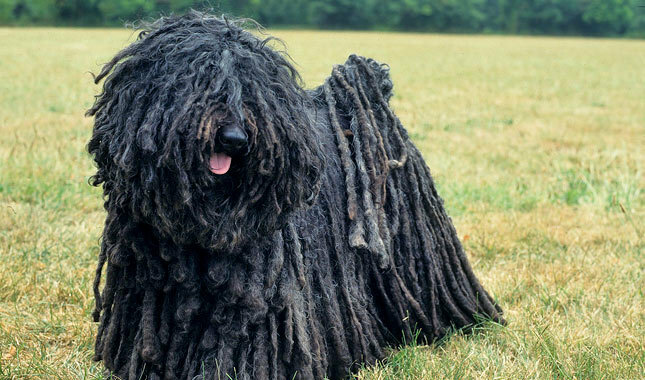 His distinctive movement is essential to the Puli's herding style. Click Here to Learn about breeder background checks on Puli breeders if you are looking for Puli puppies for sale. Click Here to learn how ResearchBreeder.com can help you find healthy Puli puppies for sale.Puli puppies for sale. Click Here to order a Breeder or Kennel Background Check on Puli Breeders that may have Puli puppies for sale. Click here to find the national breed club for Puli puppies for sale. Click Here to purchase a list of approved ResearchBreeder.com Puli Breeders who have Puli puppies for sale.